Whether you are designing online or creating a printed piece, the first consideration is your audience. Just as you would write for your contemporaries at school in a different way to your local community, so you need to apply the same consideration to your approach to design. 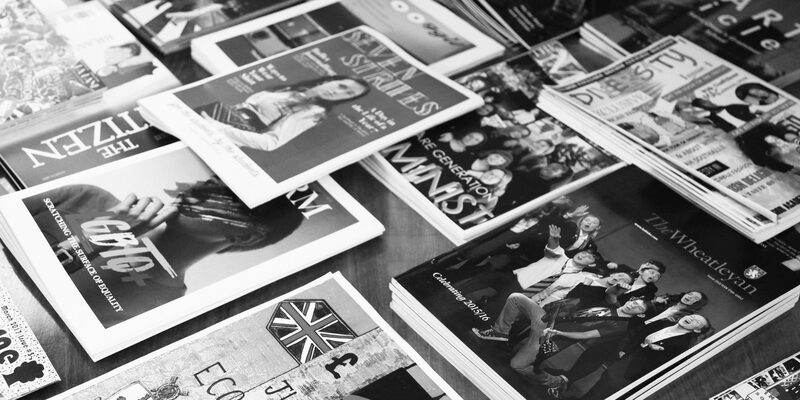 Find out what sorts of news-stand magazines and newspapers your audience read, why they like them and buy them again and again. Is it just because of what is written or the way it’s presented, or the combination? ‘Pictures, abstract symbols, materials, and colors are among the ingredients with which a designer or engineer works. If you haven’t designed a publication before you need to start with the bare bones. Literally. These bare bones are your grid. Take time to do a little research on page grids and why they are important. This page of the Shine website is really only offering a top line of the basics and where to begin and grid theory can get rather in-depth. The main thing is to apply a structure to your page layouts and ensure the magazine has a consistent flow. ‘Always use a layout grid for your design projects. No exceptions. ‘If you don’t, you’ll never be able to repeat that look consistently. Your projects will never have visual harmony, and like anything which lacks structure or a strong foundation, your concepts will be visually inconsistent from one product to another and will always be a struggle to produce. You’ll probably have noticed that the newspapers and magazines that you read all use a grid in different ways, some in a more experimental way than others. The principle we’d suggest here, that in fact can be applied to every aspect of design, is to learn from the experts, then bring your own original approach. In particular we suggest buying a copy of The Guardian and the Daily Telegraph as examples of particularly fine graphic design. These newspapers produce a completely original multi-page designed piece of print every day – there’s much to learn from how they do this and the boundaries they push. All around the world every day great newspapers produce incredible design that supports the articles they lay out by applying bold, gutsy design. Everyone wants to make a great, original design for their magazine and we strongly support this. However it’s equally worth considering established accepted rules of good graphic design before you do that. Creating a flexible grid is the first step. Here are some great quotes from a series of fantastic and gutsy ‘Design Rebels’.